How Do You Like These Onions! How you prepare an onion is totally dependant on the dish you’re creating. 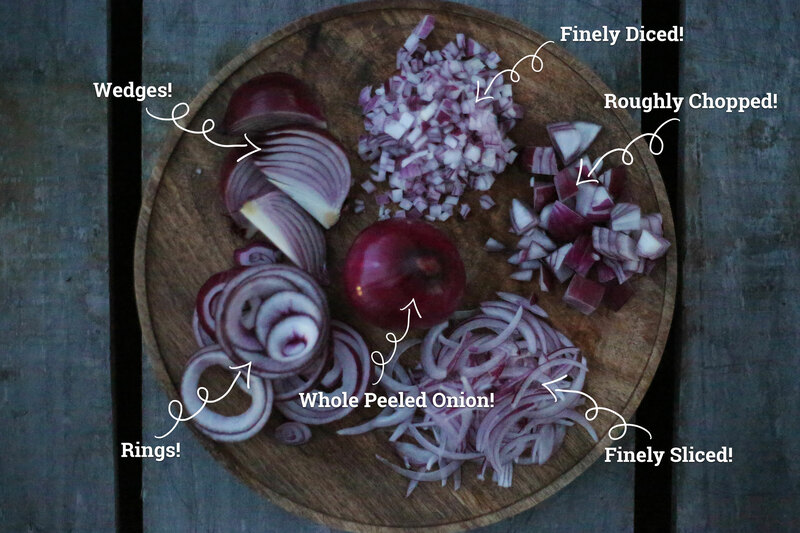 From a slow cook to a speedy salad, onions provide a delicious flavour. Totally delicious left whole or halved then nestled into a tray of potatoes before roasting… or wrapped in foil with olive oil and woody herbs then baked in the oven for about an hour until soft and tender. Wedges of onions are a great addition to tasty pots of chunky stew or jumbled together with tomatoes, chilli, herbs, garlic and a drizzle of olive oil before roasting low and slow until they become sticky and jammy for a scrumptious side dish. Raw and stacked in a delicious veggie burger or dusted with paprika flour and fried for a weekend treat... everyone loves an onion ring! An absolute go-to for stir-fries and salads! The flavour workhorse of any soup, sauce or stew! Whether you plan on a silky smooth soup or a chunky pie filling, sizzling some roughly chopped onions is always a great place to start. Whether it’s a finely diced red onion to sizzle in olive oil with garlic and herbs for a pasta sauce or a finely diced shallot to whisk into a zippy dressing - this is a small but mighty dice that imparts great flavour!